Modern-day cranioplasty, along with the burgeoning field of Neuroplastic and Reconstructive Surgery, is undergoing a significant paradigm shift related to various techniques, surgical advancements, implantable neurotechnology, and improved biomaterials. These changes have stimulated us to assemble premier thought leaders in various specialties including neurosurgery, neuroplastic surgery, craniofacial surgery, and plastic surgery to meet for the fourth annual symposium dedicated to the subjects of “cranioplasty”, “implantable neurotechnology”, and “neuroplastic surgery”— to be hosted this year in Baltimore, Maryland. The faculty will gather to present evidence-based data on surgical approaches and state-of-the-art materials, engage and network within a broad array of colleagues and experts, and share high-yield experiences to help attendees improve their patient outcomes. Interactive panel discussions following each lecture will offer the opportunity to debate the evidence, exchange ideas, and gain invaluable insight to assist with the most challenging cases. 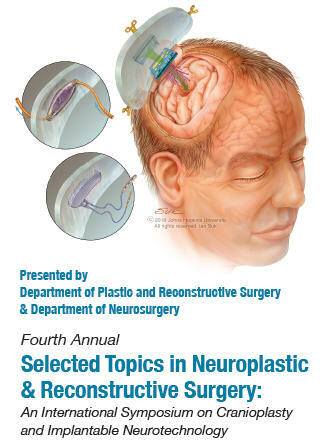 This year’s symposium will engage an international faculty and audience consisting of neurosurgery, neuroplastic surgery, craniofacial surgery, plastic/reconstructive surgery, oral/maxillofacial surgery, and otolaryngology/head and neck surgery to explore and elucidate the new insights and advances relative to skull reconstruction, cranial implants, and groundbreaking neurotechnologies. This activity is intended for residents, fellows and physicians in Neurosurgery, Craniofacial Surgery, Plastic and Reconstructive Surgery, Otolaryngology—Head and Neck Surgery, Oral Maxillofacial Surgery and Oculoplastic Surgery. Create a cranioplasty reconstruction management plan with or without implants, from peri- to post- procedural care. Discuss recent advances in cranioplasty and neuro-cranial reconstruction, and how you may incorporate them into your practice. Translate cranioplasty and implantable neurotechnology research findings to improved outcomes based on recent evidence-based literature. Employ cooperative learning to analyze practice barriers and apply appropriate solutions. The Johns Hopkins University School of Medicine designates this live activity for a maximum of 5.75 AMA PRA Category 1 Credits™. Physicians should claim only the credit commensurate with the extent of their participation in the activity. National Commission on Certification of Physician Assistants (NCCPA) PAs may claim a maximum of 5.75 Category 1 credits for completing this activity.